The continued uncertainty in Catalonia has been hitting our screens over the past few days. Although the violence has stopped, the political instability of the Catalonia, and Spain, are still in the daily news. 90% of the votes in the referendum called for independence, however, only 43% of people managed to vote due to Spanish forces seizing ballot boxes and stopping people from entering polling stations. The Catalan President, Carles Puigdemont, and other Catalan leaders, were quick to announce independence, but it was suspended because they would like further dialogue and negotiation with Madrid. Many have pointed out that Catalonian independence lasted only 8 seconds and Spanish Prime Minister Rajoy has responded by asking the Catalan government whether or not they have declared independence. Depending on the Catalan government’s answer, the government in Madrid could impose direct rule on the region. This would mean suspending Catalonia’s powers to make its own decisions on public services such as education and healthcare, and could even mean a snap general election. Direct rule is written into the Spanish constitution, but has never been deployed in democratic Spain. Independence is therefore by no means inevitable as Madrid continue to decline negotiations. Further developments have transpired as Spanish deputy Prime Minister Soraya Saenz de Santamaria has now announced that the deadline for the response to whether or not Catalonia has declared independence is now on Thursday 19th October. Carles Puigdemont has called for calm 48 hours ahead the deadline. Mr Puigdemont is facing a massive dilemma. If he says he has proclaimmed independence, the central government will step in. If he says he did not, the far-left Catalan party CUP would probably withdraw its support for his minority government. The EU want Catalonia to remain part of Spain, and Jean-Claude Juncker, the President of the European Commission, has been clear on not wanting other autonomous regions of Europe to follow suit in calls for independence, therefore, Catalonia will be given no help, political or otherwise, from the EU. Catalonia does seem to be stuck between a rock and a hard place. Growing political insecurity has continued. On the 16th October, the Spanish High Court detained and arrested two Catalan separatists, Jordi Sanchez (of the Catalan National Assembly) and Jordi Cuixart (of the Omnium Cultural), without bail, for sedition. They are being investigated over the protest on September 20th, in which a crowd blocked civil guard officers inside a building in Barcelona. 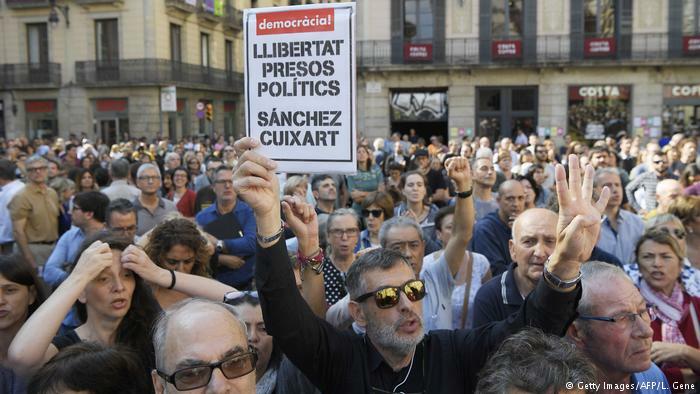 Spain has reiterated they are not political prisoners, but it is hard to see how that is- a sentiment echoed by Carles Puigdemont and many other political figures worldwide. Protests have been held in response, in Barcelona and the smaller Catalan cities of Girona and Reus. As Thursday edges closer the world is eagerly waiting for the answer of Carles Puigdemont, a decision that will have huge political repercussions for the people of Catalonia, Spain and maybe the future of Europe.